Multi Timer App - The best! So you are looking for the best Multi Timer App? There are many times when you need keep track of more than one task at a time. Cooking, Workout, Swimming laps, Physics experiments at school, Yoga and so on. 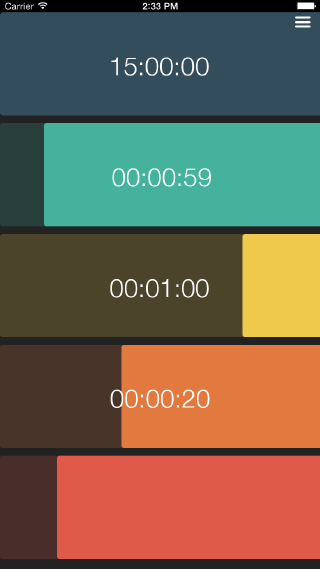 A multiple timer app will let you do exactly that that, keep track of multiple times! Sure there are quite a few multi timer apps on the App Store but none will do or work in the way the Multi Timer + app works. (and makes it the best Multi Timer app on the App Store). First of all it’s super clean. It’s not cluttered with information and icons. It’s a color line moving from one side to another. You can see with a glance how much time is left on your set timer. If you want to be more precise you can enable numbers that will show you remaining time in hrs:min:sec. All icons will fade away a few moments after you tap the screen leaving the screen with one or multiple color bars (and numbers counting down) only. This makes the Multi Time + app very easy to read from a distance no matter if you run it on an iPad or iPhone. It will look great and easy to read regardless of your device. You can have up to 5 different timers running at the same time. Just swipe down on any timer on screen and it will add another timer on the screen. Are you done with one timer? Just swipe up on that timer and it will go away. All happens very smooth and dynamically using the screen in the most efficient way. Need two timers to start at the same time? No problems just tap and hold both timers and a chain will show telling you that the timers are linked. Double tap one and both will start at the same time. You don’t even have to have the same time set for them. (One will run out before the other). The Multi Timer + app got a great selection of alarms when the timers run out. Set different sounds for your timers and know by the sound which one is done. You can even set the phone to vibrate and flash with the led-light instead of sounds if you want to run timers silently. 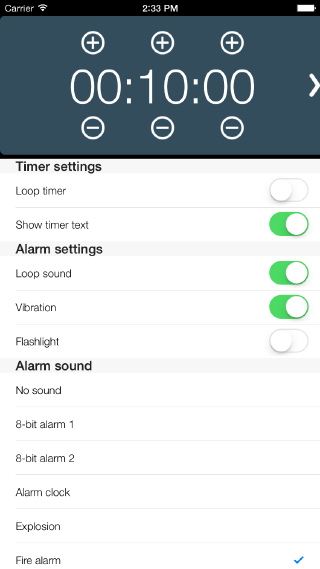 Loop timers if you need to restart countdown when they run out and loop the alarm if you really want the Multi Timer + app to get your attention when the alarm runs out. Multi Timer + is perfect for classrooms and everywhere you need to know the remaining time at a glance. Missing a feature. Just let us know and we will put it in the app in the next update. Download the Multi Timer App for Free!